Promotional Drumsticks or Promo Drumsticks professionally Imprinted in the USA. Buy large quantities of drumsticks wholesale from DRUM BUM, a reputable brand of 20 years. Call us today at 1 800 378-6286. Blank Drumsticks - We have blank drumsticks available for imprinting. logos, team events, or promotional slogans. You name it, we can do it. Custom Drumsticks - Have special-size drumsticks made for your specific application or for promo events. Colored Drumsticks - We can now imprint on solid colored drumsticks. Light Up Drumsticks - We can also imprint light up drumsticks! Full Color Drumsticks - Make a stunning impression with full color! Workout Drumsticks - Exercise and workout with fitness drum sticks and cardio drumming drumsticks. Buy in bulk and save! Since 1999, Drum Bum, Inc has been serving the music industry with unique music gifts and promotional music products for private parties, corporate events, store displays and more. Recently, our products were shipped to HBO and Deckers in addition to several other companies and bands. Our products have been on TV, in movies and even in department store windows. We are proud to have been able to offer unique, quality products and 100% first class service to such esteemed brands through the years. We appreciate their business and we look forward to yours. 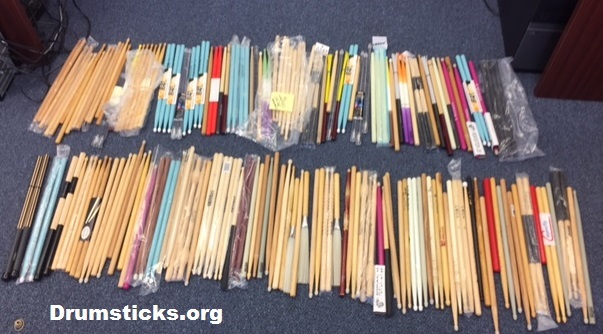 Wholesale Drumsticks are available in different wood types, sizes, tips, and finishes. Here is a fun order where a customer wanted all different types for a large Broadway show event in New York. We were happy to help him out! Since 1999, Drum Bum, Inc. has been a leader in the industry. When it comes to drumsticks, we can help fulfill your needs. We've sold large imprinted and custom engraved orders to name brands as well as wholesale orders to smaller companies that may only need a hundred or so with their marketing slogan or logo on them. Have a special event and want a cool idea to promote it? How about "drumming up" some extra attention with a fun product like drumsticks. Everyone wants to be a drummer and everyone loves the drumming theme! Go with a name you can trust. Drum Bum is a 20 year, trusted brand.